If I was buying one, I probably wouldn’t choose white. But that aside, the 370Z is the perfect antidote to the sanitised BMW, Audi and Mercedes sports cars that blend in and then disappear in a supermarket car park. That certainly won’t happen with the Nissan. While some of the styling reminds me of a Porsche 911, it’s the sort of car that could give you a complex, if you worry about people looking at you. It’s impossible not to fall for 370Z. It sticks two fingers up at the mainstream opposition, all is all the better for it. If you want a coupe that dares to be different, take one out for a spin. It’s a muscle car for the modern age. Heavy steering, long-throw manual gearbox and brutish looks. Most importantly, it will make you happy, every time you see it parked on the driveway. 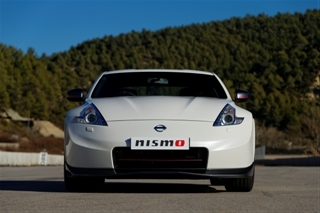 Nissan 370Z Nismo – Fairlady? Nissan has only ever surfed the edge of performance car. But when the Japanese manufacturer has dipped its toe, the vehicle has been branded with a Z. Not surprisingly, in the UK they became known as Zed cars. The first appeared in 1969 when Nissan was still branded Datsun here. However, the Nissan Fairlady Z was only sold in Japan until it was rebranded 240Z and sold abroad for the first time in the early 70s, followed by the 260Z and 280ZX in later years. The re-styled 300ZX arrived in 1983 and it survived in various forms until 2000, when many thought the age of Nissan sports cars was gone for good. Not so, and the 350Z, which sports the DNA of our current 370Z test car, was introduced three years later. 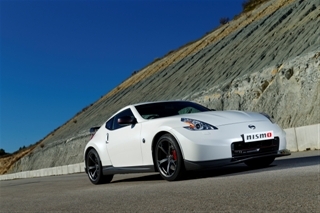 The 370Z is still known in Japan as the Fairlady – a moniker thankfully dropped for the European market! On the upside, that 3.7-litre engine is just explosively fast. I’ve read reviews claiming it’s course and outdated but in a age of silky smooth, turbocharged units, the Nissan is refreshingly engaging. So, if you want BMW/Audi ease of use, go elsewhere. We’ve had a week of dry weather but today the heavens have opened and I imagine the 370Z is going to be quite a handful, with 340bhp going through the back wheels. Still, with 19-inch alloys as standard and razor-sharp handling, what else could you need to enjoy your eggs this Sunday? 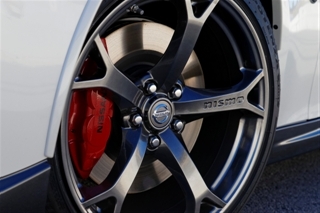 Nismo is the motorsport and performance arm of Nissan. Not as well known as BMW M Sport, or the performance arms of other European manufacturers, Nismo has still competed in Le Mans, Daytona and the GT Championship. 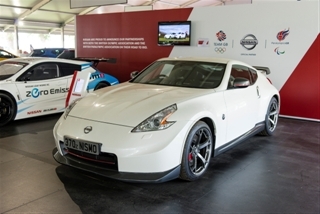 When the 370Z Nismo model was launched last year, Nissan insisted the car was not a full-blown Nismo variant, more of a makeover. All I can say is, when are they planning the real Nismo 370Z because this one is outstanding. While the 370Z has always been a heavy car, tweaking the 3.7-litre V6 to 340bhp adds the extra performance the Nissan needs to border on super car potential. Some have called the engine harsh but I disagree – think of it as more of a sophisticated muscle car and you won’t be disappointed.I love driving this Nissan, even at humdrum speeds it feels superbly balanced and sharp. More tasty than a hot cross bun with lashings of butter… Yes, the 370Z is just the sort of coupe that makes you long for a sunny, dry weekend to engage with a British country road. If you want light steering, easy to park and good visibility, then try a Golf GTI and blend in the with crowd. The Nissan is an absolute monster of a car but it has one extra missing from most hot hatchbacks – it’s fantastically great fun and will put a smile on your face. Guaranteed. I can even forgive it the crazy rear spoiler, which I’ve decided is a lot prettier than it appears on first sight. It’s big, large enough to take a suitcase strapped to the top, but you have to be a big, bold character to own a car like this is the first place. Of course, all this fun has a price and I’m watching it happen in front of me. The fuel gauge is dropping at an alarming rate. Like 22mpg, ouch. It’s the last day before Easter and it feels like I’ve been driving a Scaletrix car. 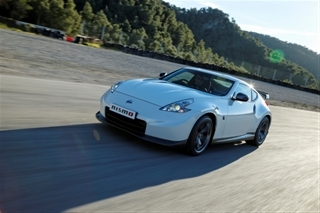 In fact, the 370Z Nismo not only looks like a crazy toy coupe, it performs like one as well. 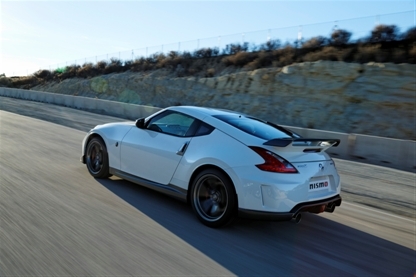 In Nismo clothing, the 370Z is equipped with a huge rear spoiler that harks back to the 1980s. In fact, it actually gives the 370Z negative lift, or downforce, and therefore does serve a purpose. Quite important in a car capable of 155mph and 0-60mph in 5.2 seconds. First impressions of the Nismo? Well, the styling means it’s not for the shy, retiring type. It’s reminds me of a retro muscle car, bristling with macho appeal, loud, slightly offensive and raw, in a refined ‘Nissan’ way, of course. And because of all that grunt under the bonnet, it goes well too! There’s a long throw on the manual gearbox which only adds to the retro appeal but wind up the V6 and the Nismo really does feel fantastic.